Back in 2010 I created a site for a local beekeeper and honey producer. That site was for his swarm removal service. A year later he asked me to create a site for his bee selling service. He breeds and sells native honey bees. 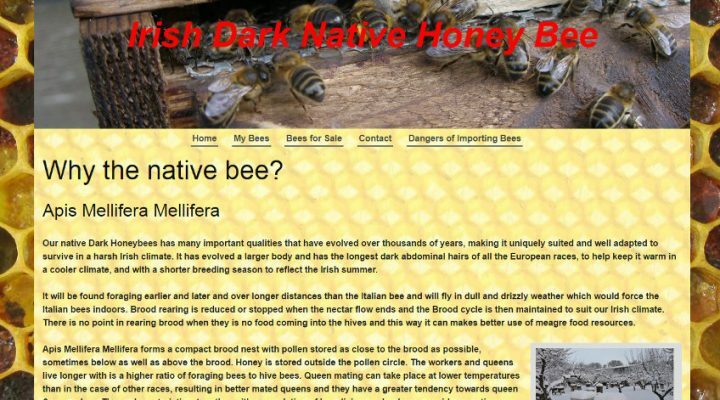 The site explains the numerous benefits of using a the Irish dark native honey bee for beekeeping in Ireland – simply: the native bee has evolved over thousands of years to be uniquely suited and well adapted to survive in a harsh Irish climate. It also discourages importing bees as there is a significant risk that they will bring in diseases that are harmful to native bees. Keith also sells bees from his site. The site uses Blueprint CSS for the layout. The content width was expanded about 25% per Keith’s request. Keith provided all the photos used on the site.